Scoff at James Vandenberg at your own risk. Iowa comes into Ohio Stadium on Saturday with Vandenberg at quarterback. He's a raw, redshirt freshman, an unheralded recruit -- three stars, according to Rivals.com -- from little Keokuk, Iowa. Then again, the player Vandenberg is replacing, the injured Ricky Stanzi, was only a three-star recruit out of Mentor Lake Catholic -- east of Cleveland -- and he had the Hawkeyes off to a 9-0 start and up to No. 4 in the Bowl Championship Series rankings before a loss this past weekend. Shonn Greene, who led the Big Ten in rushing in 2008, was only a three-star recruit. So was Pat Angerer, a senior linebacker who anchors a fierce Hawkeyes defense ranked 14th nationally. The point is that in the 11-year tenure of coach Kirk Ferentz, players seem to leave Iowa City much more decorated than when they arrive. It's a testament to Ferentz's coaching acumen and recruiting prowess that in the past eight years he has won 68 games, shared two Big Ten titles and played in five New Year's Day bowl games. A win Saturday would clinch Iowa's first Rose Bowl appearance since 1991. The fact that Ferentz has done it in the least populous Big Ten state makes his record even more impressive. Iowa has 3 million people. The next-lowest Big Ten state is Minnesota with 5.2 million, and four states have more than 10 million. "Geography and numbers tell you that our biggest challenge is recruiting," Ferentz said. "The high school football here is excellent, but we're never going to be in a situation where we can recruit 15 players a year in-state. It just isn't realistic. "So we have to go out of our state to recruit, and for most schools, that's a huge obstacle." There are 51 native Iowans on the Hawkeyes' roster. Compare that to 81 Ohioans on Ohio State's. The other Iowa players come from 17 states -- from Montana to Massachusetts. In the past five recruiting classes, Iowa has landed just one Rivals.com five-star (offensive lineman Dan Doering), 16 four-stars and 50 three-stars. Ferentz's philosophy is to find kids who fit a certain profile. "Realistically, what we have to do is realize we're not going to get as many players that my sister could tell you are good players just by looking at them on tape," he said. "We're going to have something a little different in guys and hope we get guys who have upside and have the attitude where they want to develop." That profile includes throwing out the height and weight chart, Ferentz said. Safety Bob Sanders is 5 feet 8, but he worked out all right, going on to stardom with the Indianapolis Colts, where he was named the 2007 NFL Defensive Player of the Year. It also includes a certain mind-set. "They take guys who want to come to Iowa, who are tough, hard-nosed, go-to-work type guys," said Charles Davis, a Big Ten Network analyst. "They get a lot of hard-working, prideful kids." The other component, of course, is developing the players. Ferentz has a veteran staff of assistants, led by offensive coordinator Ken O'Keefe and defensive coordinator Norm Parker, who have been with Ferentz his entire Iowa tenure. "They do a great job of taking kids and enhancing their strengths," said Cleveland Glenville coach Ted Ginn Sr., who has three former players on Iowa's team. Ferentz's best stretch was 2002-04, when he won at least 10 games each season, all with different starting quarterbacks -- Brad Banks, Nate Chandler and Drew Tate. Iowa dipped to 19-18 from 2005 to 2007, but won seven games last year and almost certainly is headed for another New Year's Day bowl this year. It starts with getting three-stars and turning them into all-stars. 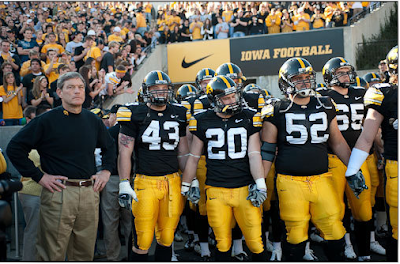 "Our good teams have had a lot of guys that just are all great stories," Ferentz said. "And if you have enough good stories, you have a chance to have a good team." Labels: kirk ferentz, NC Sports Coaches in the News, ted ginn sr.